Yuji Tachikawa and Hiroaki Ishiura will start Friday’s Fuji GT 500 km Race from pole position after qualifying on top in their Lexus Team Zent Cerumo car on Thursday. Tachikawa took his 23rd GT500 class pole with a time of 1:27.904 in the No. 38 Lexus LC 500 ahead of the second Super GT race of the season. Qualifying was rescheduled after heavy fog affected the morning’s running, with a single 20-minute session held for each class instead of the usual Q1 and Q2 format. Heikki Kovalainen went fastest early in the session for Lexus Team SARD but his time was later beaten by Tachikawa who took his first pole since the Fuji race last year. Felix Rosenqvist and Kazuya Oshima will start from second in their Lexus Team LeMans Wako’s car, 0.170 seconds down on the polesitters. The fastest Nissan GT-R was the No. 23 NISMO car of Tsugio Matsuda and Ronnie Quintarelli while Hideki Mutoh and Daisuke Nakajima made their No. 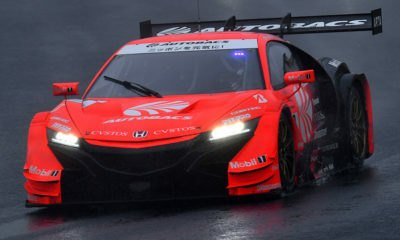 16 Team Mugen entry the highest-placed Honda NSX-GT. They qualified third and sixth, respectively. Autobacs Racing Team Aguri will start from GT300 pole with its No. 55 BMW M6 GT3 driven by Sean Walkinshaw and Shinichi Takagi, meanwhile. Takagi posted a best time of 1:36.573 on his last lap, securing his 13th career pole. The 500-km (310-mile) race will get underway at 2:40 p.m. local time on Friday.